sfz has its own index page. Kontakt has its own index page, too. I spend a few hours each week jamming live on the internet with anyone who happens to be around and can stand me! Everything gets recorded, and I&apos;ve selected the less objectionable ones for public display. Most of the recordings happen from various NINJAM servers but I also hang around on Jamulus, either my own server or one of the public ones. Mine has recording enabled and I publish the (raw stream) recordings here. In addition to getting paid for programming, I also do it for a hobby. For a while (1995 to 2013), this was mostly in C# for Sims2 (SimPE) and Sims3 (sims3tools from ). Both are open source projects hosted on SourceForge (SimPE, sims3tools). Another C# project was my TrapKAT Editor for .Net. It has subsequently be rewritten to be cross platform in Scala. jTrapKATEditor has its own site over on GitHub. Contact details and a little about me. 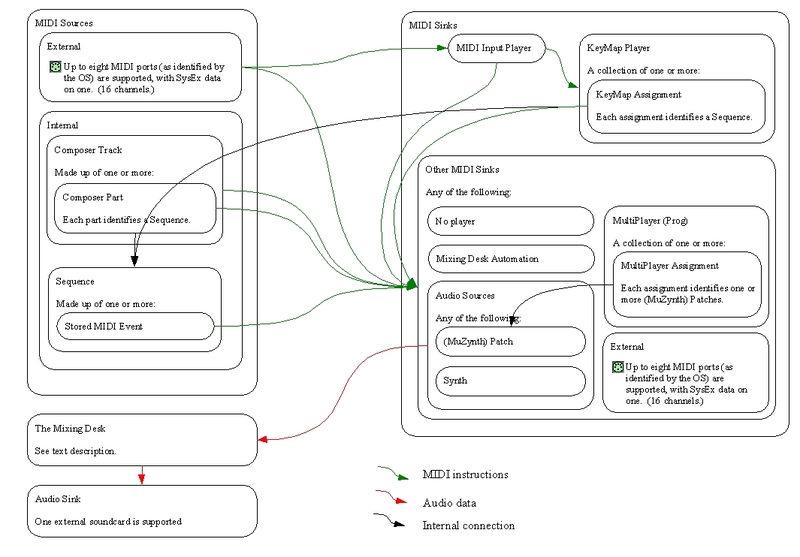 Muzys Wiring - a picture of how I think Muzys looks inside. Computer Music "Shooting Stars" for Muzys: part 1 and part 2.
ns_kit 7 (free) mapping for Muzys. You need to get the samples from naturalstudio. And a forgotten "brass" patch for MuZynth: plj_brassy.Ipa. Not actually here but Muzys-related, Digital Musician Exchange hosts a Muzys User Forum. My sound input plug hack has its own page. As does my semi-modular VA hack. There are a few MP3s over on SoundClick. My wife and I used to develop and run a *nix BBS. Click above to go to the "support" group for users. I used to run a Viewdata BBS. Rob O'Donnell is running the "Celebrating the Viewdata Revolution" site where my BBS is accessible as it was as of the final back up (more or less), in Web format. Click the logo above to step back in time to 1990. He also hosts the legendary The Gnome at Home pages. Generalise where I jam - it is not just NINJAM any more! 29 September 2018: Generalise when I jam - it is not just weekends any more! 2 April 2016: Oh, I rewrote the JSON jams page in AngularJS ages ago... And jTrapKATEditor is released. 7 June 2015: Add some meta tags. 12 July 2014: Promote TrapKAT editors, both .Net and JVM. 4 March 2014 Promote new "json" version of jamming page. 17 January 2013: Time for a spring clean. Old things are now clearly old. 4 April 2010: Might as well link the nice fancy new jamming page. On dino. 2 March 2010: And update Sims links. Drop the wap site as it&apos;s never there. Add links to Rob O'Donnells site. 7 May 2008: Contact details moved, adding link to Jamming page. 2 January 2006: Soundclick moved. 6 September 2005: Added a mention of pjse and link to sourceforge. 20 March 2005: Mmm, no directory listings. Temporarily removed SynthEdit/ link while I sort it out. 19 March 2005: Minor tweak to 404 handler. 8 March 2005: Oops, now drealm.info is prime site: reference to org.uk amended! 2 March 2005: Added link to DMX Muzys forum. 26 February 2005: Prime site now on drealm.info domain, added about page, moved logo. 2 January 2005: New page content now W3C XHTML 1.1 compliant. 1 January 2005: New year, new page content. 27 December 2004: Minor tweak to layout. 21 September 2004: Amended URL for ns_kit. 7 August 2004: Added WAP site address. 4 July 2004: Added links to soundclick and ns_kit samples.